For many travelers, a tent is not just a weekend retreat, it is home on the road for weeks if not months on end. For those on extended journeys, spanning all four seasons and on roads prone to destroy delicate gear, finding a tent worthy of the trip is not easy. 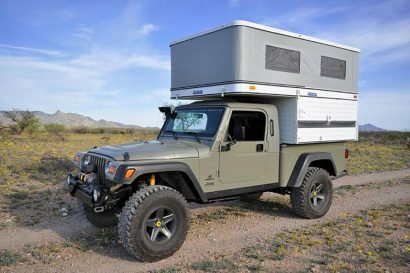 Over the last 2 years, I set out to find the most durable, versatile, and livable portable abodes suitable to overland travel. Some are brand-new entries, others proven over the course of decades and hundreds of thousands of miles of travel. All of them are worthy of serving as your home away from home. 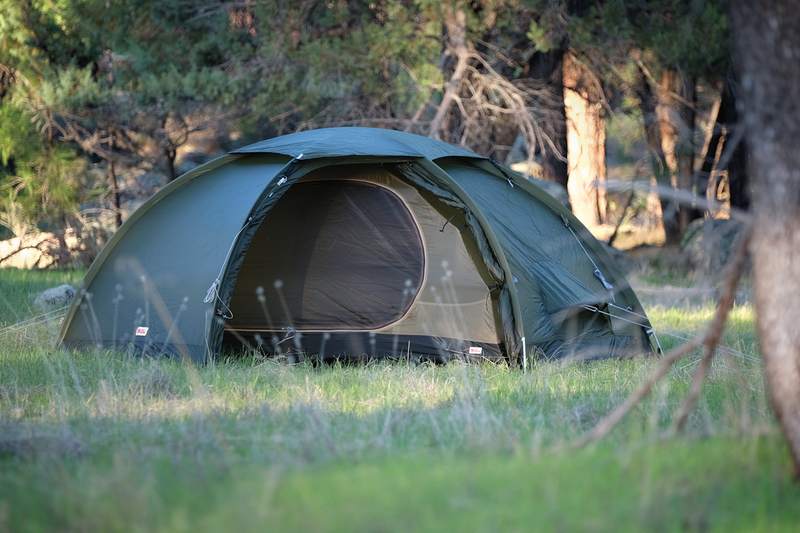 With one of the most extensive offerings of tents in the outdoor industry, from pint-size to palatial, the Foidel Canyon 2 could be best described with one word: tough. Although it was created to appeal primarily to high-mountain endeavors, it possesses a handful of traits perfectly suited to the types of travels known to quickly destroy lesser shelters. The most unique of those qualities is the use of ultradurable 100-denier HMPE ripstop nylon fabric in the floor, rainfly, and stuff sacks, the components most frequently damaged in use and transit. The secret ingredient in the brawny cloth is Dyneema, a high-tech fiber typically used for climbing applications where tensile strength and cut resistance are critical. Used exclusively in the ripstop weave, it lends impressive tear resistance. 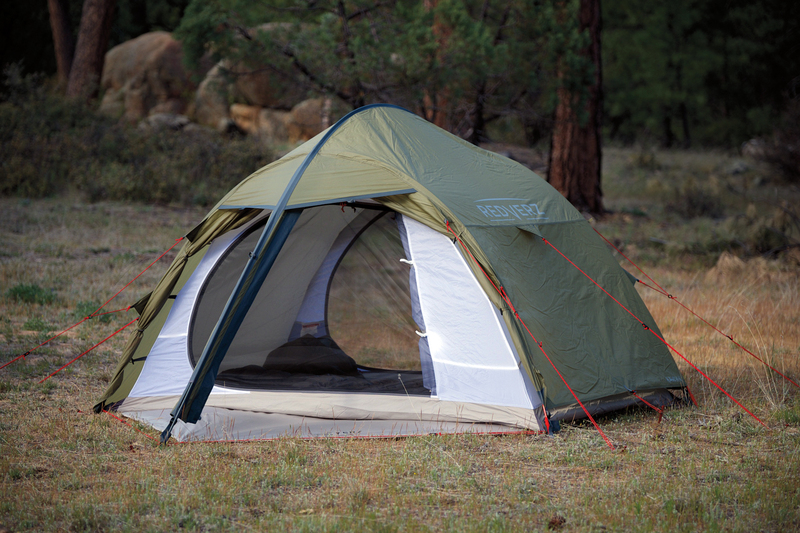 To save weight, bulk, and to amplify breathability, the canopy is constructed of lightweight ripstop nylon. Despite the heft of the fly and floor fabrics, the two-person Foidel tips the scales at just a shade under 5 pounds. As we expect of all tents built for demanding conditions, the two cross poles and short spreader pole are made of 9-millimeter anodized aluminum provided by DAC, the leading purveyor of tent poles. The freestanding architecture employs 11 plastic clips to facilitate a quick pitch while allowing air to flow freely between the fly and main body. Mesh panels at the peak of the canopy pair to vents in the rainfly, and mesh-backed windows on the dual doors also help improve ventilation. For use as a four-season shelter in all but the warmest weather, the Foidel does better than expected to keep a cool breeze circulating, particularly with both of the large vestibules rolled back. If there is one foible to the Foidel, it is the black rainfly, which heats up considerably in direct sunlight. 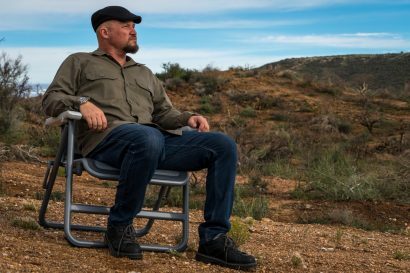 Initially targeted to mountaineers, the Foidel is great for motorcycle or vehicle travel where space is limited but dependability is of paramount importance. The doors are easy to enter and exit and the packed size is not much larger than tents made of far less substantial materials. My first night in the Abisko Dome 2 and my first time in a Fjällräven tent of any kind was an eye-opening experience. With a late spring storm driving a constant pelting of icy grapple onto its nylon walls, I comfortably snoozed away the night. Designed and built for the challenging weather of the Swedish backcountry, the Abisko Dome is a veritable nylon fortress. Sized for a cozy pair, its architecture is uniquely European with the three equal length DAC Featherlite NSL poles slipped into sleeves in the rainfly. The outer layer creates a taught exoskeleton with the canopy anchored within. The benefit to this type of design is twofold. The greatest advantage is the ability to pitch the body and rainfly simultaneously. Intended to simplify setup, which it does to a large degree, the sleeves take time to thread. It’s worth the effort, as the design also keeps the inner tent sequestered from weather right out of the bag. When forced to pitch the Abisko Dome in a pouring rain, keeping the living space dry is an obvious plus. Extending its use slightly beyond three seasons, the shape is round enough to deflect wind and shed minor snow loads while not sacrificing the verticality of the inner walls. 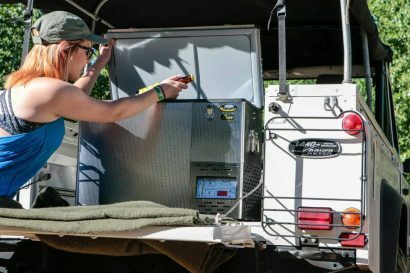 The two equal-sized vestibules swallow large volumes of gear and when rolled open help move air through the tent via two oversized, mesh-backed side doors. Additional vents at the ends and peak ensure even the hottest nights are not miserable. Over the span of many months, the Abisko Dome has been surprisingly cool on summer outings, and because all of the vents can be sealed tight, makes for a snug retreat on chilly nights. Fjällräven has never been one to cut corners, and they certainly didn’t with their premium backcountry bunker. The silicone coated fabrics are extremely light yet durable, and the zippers, pegs, and stuff sacks are made to high standards with not a stitch out of place. The greatest surprise to me given the robust build is the low packed weight of just 6 pounds, 11 ounces. There’s a lot to like about the Abisko Dome 2. It is perhaps the best of the bunch for functionality in climates hot to cold. In 1971, Swedish forester Bo Hilleberg set out to design, build, and sell the best tents in the world. While many things in life are subjective, I believe Mr. Hilleberg did exactly that. His products are sans rival. To fully appreciate the Nammatj GT 2, we have to retrace Hilleberg’s design legacy back to its inception when he searched tirelessly for revolutionary new fabrics like silicone-impregnated Kerlon. With a tear resistance six times greater than contemporary materials, it provided exceptional durability and waterproofness. The Nammatj GT 2 is made of an improved iteration of that first textile dubbed Kerlon 1800. I can’t tear it, and I’ve intentionally tried to. As stout as the fabric is, particularly when stretched evenly across the three 10-millimeter DAC aluminum pole segments, it is the tunnel structure that makes this one of the most storm-worthy shelters in the world. Although not freestanding, the arched design creates steep walls for maximum internal livability and also to better shed rain and snow. It is virtually impervious to high winds. With three equal-length poles slipped into sleeves in the rainfly, the two-person inner canopy hangs from the outer shell allowing both to be pitched in one effort. The vestibule has its own dedicated support pole creating lofty headroom and a large annex to store equipment. It also provides superb weather protection for the large main door of the inner tent. The vestibule includes a mesh door panel and a large vent covered with a protective shroud. A similar vent at the opposite end helps draw in fresh air. At a couple of ounces over 8 pounds, the Nammatj GT 2 is by no means lightweight, but that’s not necessarily a drawback. Most people reach for it because of its storm worthiness. The sleeves can accommodate a second set of poles for maximum reinforcement and the zippers, tie-backs, and guylines are made of oversized webbing and cordage. A testament to the Hilleberg reputation, the nastier the weather gets, the more comfortable it is within its protective sanctuary. The only drawbacks to the GT 2 are the full-coverage rainfly and modest ventilation features. Better suited to Siberia than the Sahara, it does best in all but the warmest seasons. The newest contender in the group, the Hubba Tour 2 hits retailers just as this issue goes to print, but I received our test sample early last summer with ample opportunity to put it to work. 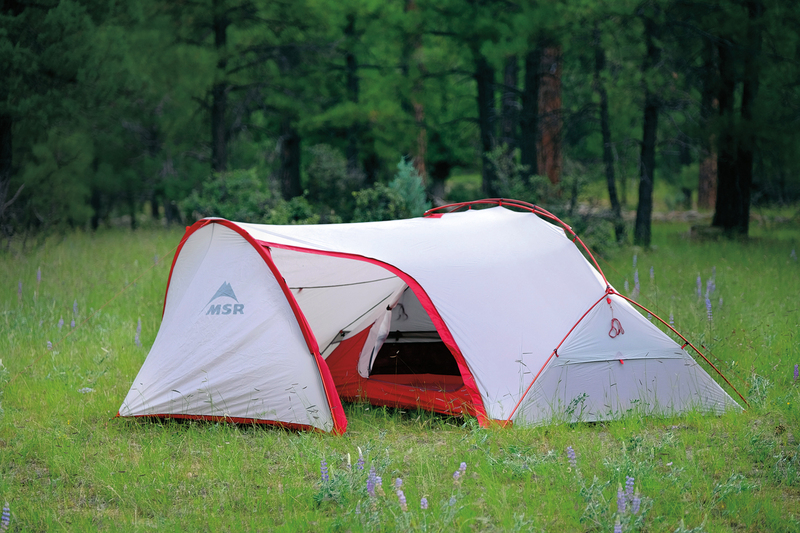 Whereas most of the tents offered within MSR’s legendary Hubba line share similarities in design and features, the Tour 2 is a significant departure. Purpose-built for travelers on extended journeys, the Tour’s most prominent features include a cavernous vestibule held aloft with a dedicated support arch and a unique exoskeletal framework which places the aluminum poles on the outer aspect of the rainfly. The tent is affixed to the poles with a series of clips making it the easiest one to set up or break down out of the whole bunch. With the inner canopy attached to the inside of the rainfly, there is no risk of getting it wet during pitch or takedown. Adding to the weather-shedding features, the vestibule is nearly equal in size to the living quarters and includes a small floor section to keep items off soggy ground. A large door allows for easy entry and exit with no need to crawl over your mountain of gear. The body includes front and back doors with additional shrouded ports in the extreme ends of the fly to further reduce condensation and bolster air circulation. Treated with MSR’s new Xtreme Shield waterproof coating, the Tour 2 has been dry as a bone, even when pitted against our nastiest Southwestern monsoon rains. 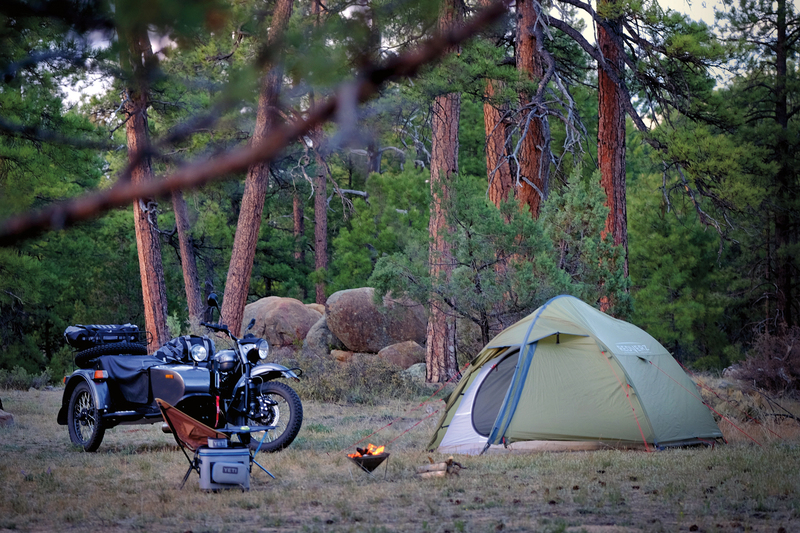 For motorcycle travel, the ability to protect boots, helmets, and dirty riding layers while not dragging them into the clean sanctuary of the inner tent body is a definite perk. Cleaner items get placed on the nylon floor; dirtier items are stashed on open ground. Pockets within the spacious interior keep essentials within easy reach, and the 4-pound, 13-ounce weight makes this the lightest of the group, if just by a matter of grams. A relative newcomer to the market, Redverz launched their brand just a few years ago with an innovative shelter designed to house two occupants and a full-size touring motorcycle. Their latest model, the Hawk II, swaps the garage for additional features and a considerable reduction in weight and bulk. Engineered to perform in all extremes of weather and made of durable fabrics and materials, it is purpose-built for the unique demands of extended motorcycle touring, although it would make a superb option for travelers of all kinds. Like the other models tested, the Hawk II places its 9-millimeter, aluminum DAC Featherlite NSL poles within sleeves anchored to the rainfly. The inner canopy is attached to the underside allowing simultaneous pitch of the two main components. 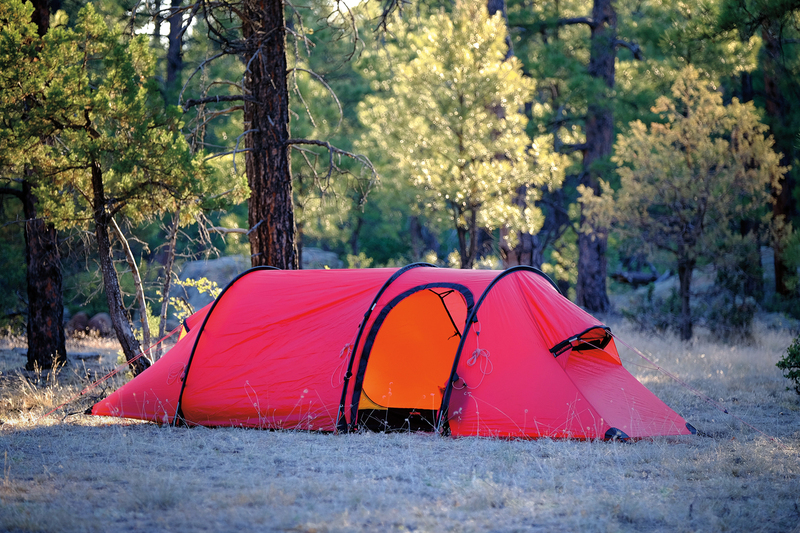 A full-coverage groundsheet can be left attached during setup and takedown to further sequester the inner habitat from foul weather. That floor layer extends into the two large vestibules, providing an ideal stowage area for gear best kept dry and clean. When zipped tightly to defend against heavy rain, the rainfly extends all the way to the ground ensuring the inside stays bone dry, while four large-volume vents near the peak keep air moving to reduce condensation and heat buildup. For use in warmer, drier conditions, the vestibule shrouds can be retracted completely and mesh panels in the door exposed to create cooling air passthrough. The nicer attributes of the inner canopy include the verticality of the walls, high peak, bright fabric color, and a minimum of seams which lend it a clean appearance that seems to amplify the space. 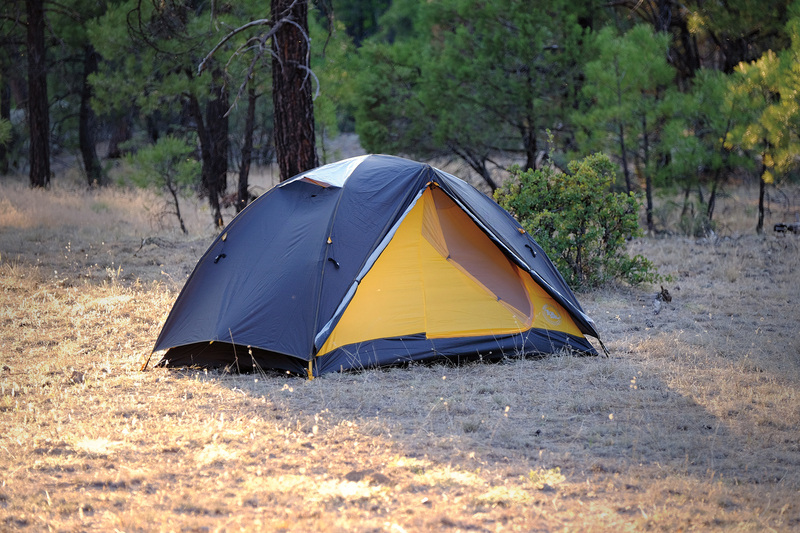 At nearly 6.5 pounds with the optional groundsheet, the Hawk II is slightly heavier than other tents in this category, but the weight is properly invested in 70-denier polyester floor fabrics and 40-denier nylon rainfly material. The guylines, each stowed in their own velcro pocket, are made of large-diameter cord and the ground pegs of durable extruded aluminum. It’s a brawny and feature-rich abode designed to complete a lap of the globe regardless of the season.